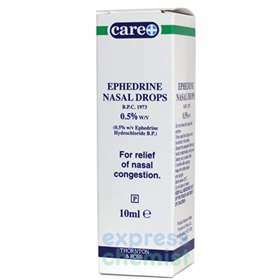 Care Ephedrine Nasal Drops 0.5% 10ml for relief of nasal congestion. Adults, the elderly and children over 12 years old. Place 1 or 2 drops into each nostril when required. Do not use the drops more than 4 times per day. Do not use the drops for more than 7 consecutive days. Put your head back and using the dropper place the drops into each nostril. Do not insert the dropper directly into the nostril. Do not share the drops with anyone. Ephedrine hydrochloride 0.5% w/v, chlorobutanol, sodium chloride and purified water.